While this project isn’t frilly or foofy, it was a fun one and I’m quite pleased with how it turned out. 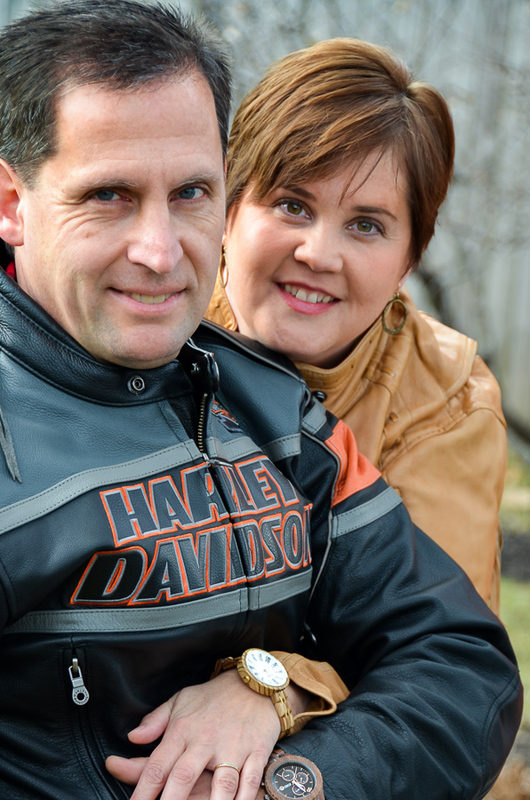 After all, how can you go wrong with old denim and genuine leather?! February’s category in our Junk Visionary group is Valentines. I decided to use denim and leather to create my ‘junk’ project. Both come from discarded items found at thrift shops. 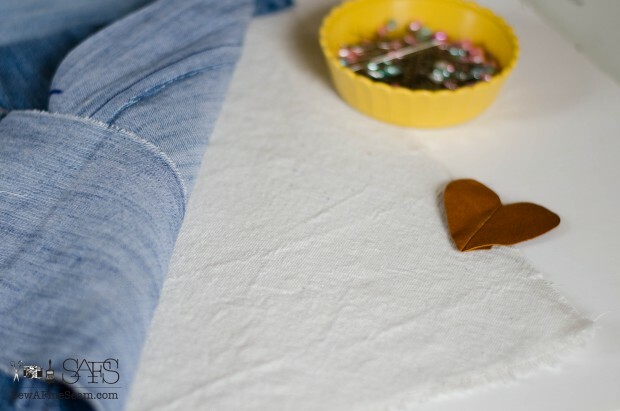 I used a canvas pillow top for my base to sew the denim scraps to. I played around with the layout a bit, then removed the pieces with pockets and pinned the main pieces to the canvas. After stitching down the base pieces I pinned on the pocket pieces where I wanted them and stitched them on too. 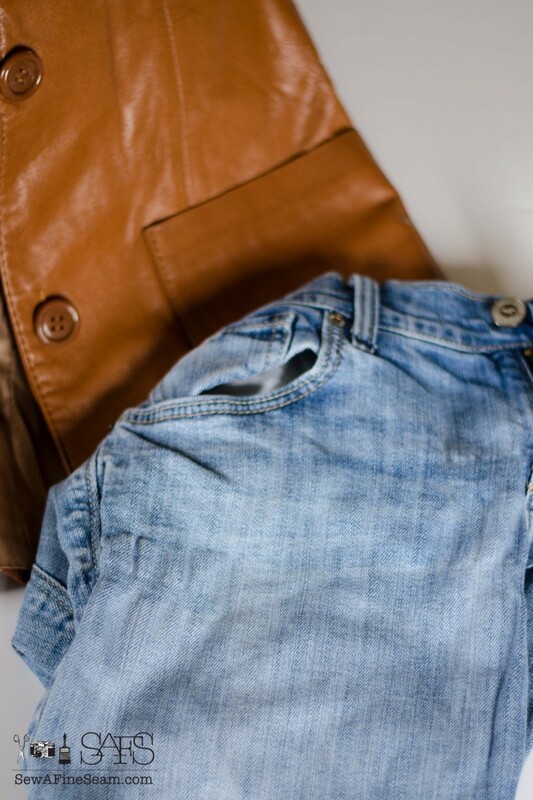 Tip: use a heavy duty or denim needle and go slowly over the heavy seams of the old jeans. Final touch was to stitch on a few hearts. I like the whimsy of them tucked into the pockets. The leather hearts are cut from genuine leather jacket found at a thrift shop. The print heart is a cotton fabric I had in my stash. Pillow was then created as an envelope closure pillow – you can find a tutorial for making an envelope closure pillow here. Another thing I really like about this pillow – it’s not strictly Valentine’s only. It works all year round since it’s made of denim and leather. I rather like the way the pillow looks against my piano and this plaid blanket looks sweet with it too. I found this plaid blanket on IG – follow The Urban Barnhouse – she has lots of purge sales and offers some wonderful items! Tip: keep your eyes peeled for plaid blankets and scarves at thrift stores, garage sales, and clearance racks – they are wonderful to pull out for a fun pop of color in decor! And now – please hop over to see what my friends did this month using junk to create something for Valentines! Love the cushion ! The leather patches are a nice touch. I love to work with denim and keep all the families old jeans for upcycling projects. I think I’ll be keeping everyones old jeans from now on! This was so fun and I love the end result. I’m going to have to get it to my friend soon or I might end up deciding to keep it and hope she forgets about it! 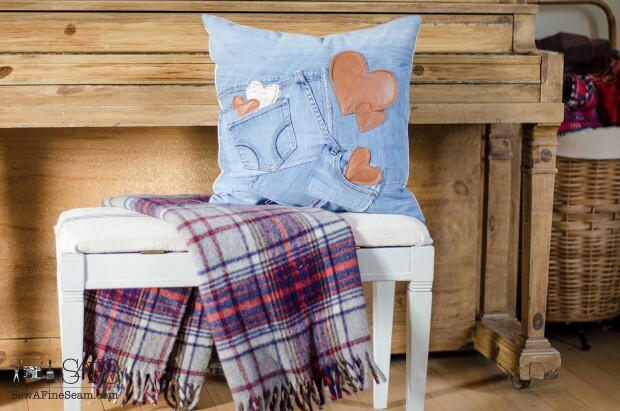 Jill, this denim and leather pillow is awesome!! 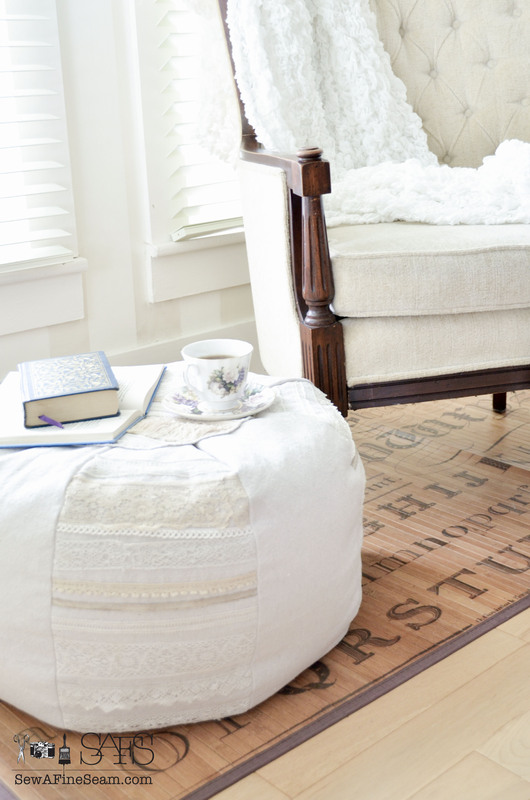 Pretty repurpose!! Thank you Keri, I love the mix of denim and leather! great tips and I love the pillow. I make things with old jeans all the time and have a great stash! The leather touch is such a cute idea. I have a goal of making more pillows this year – you always inspire me! Thanks Kim – it’s fun to create a new design in a pillow – I do the same thing so much of the time filling my wholesale orders and it’s fun to take a bit of time to design something new! Love this idea. I can see this being used all year long and not just for Valentines Day. Me too, that’s one reason I love it so much! And hearts are definitely an ‘in’ trend right now too! 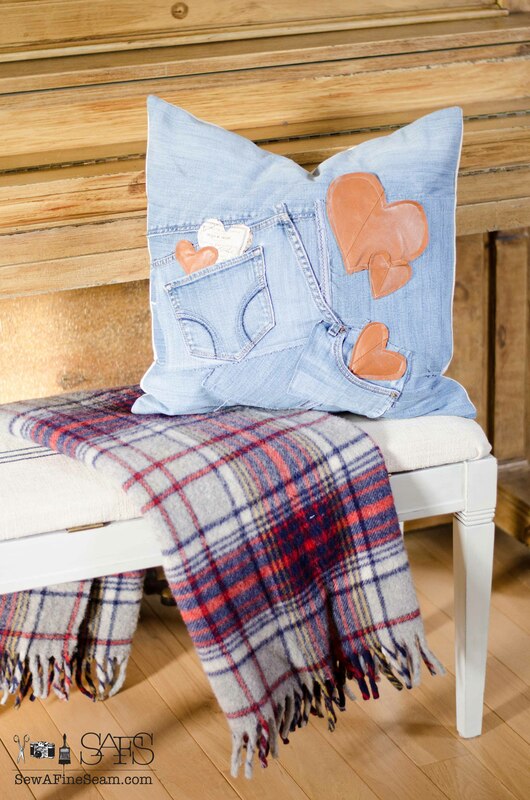 Jill I just love all the pillows you make…but this one I think is my favorite…love love love it! Thanks so much Tammy! 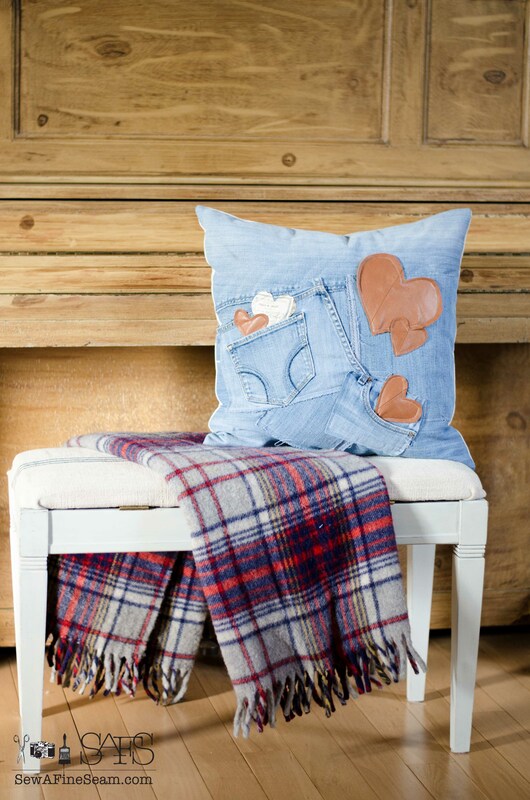 I think I’m going to have to make a few more denim scrappy pillows for the shop and summer events. I’m thinking red white and blue stars in the pockets for Independence day! Kathleen the leather jackets at thrift stores are the BEST way to get some genuine leather at a reasonable price! You can also look for leather skirts or pants too! This is fabulous! I love the leather hearts! Well done. Wow! I love how your pillow turned out. It’s so cool! Thanks so much – I had so much fun with this one! Love the layout and design of where you placed the pockets and hearts. Love that some of them are tucked away and the mix of materials! You have a great eye! And you have me wishing I had a working sewing machine! Thanks Lucy – hope you can get your machine fixed or get a new one soon! It’s a fun way to create some great projects! 🙂 Well get that baby out and dusted off! LOL! This was a fun one to create – I’ll be digging through the girls pile of outgrown clothes now to nab their old jeans before the pile heads off to the spring garage sale in a couple months! Denim is one of my faves. Your fiend is going to love this, it’s absolutely adorable and looks so well made!! 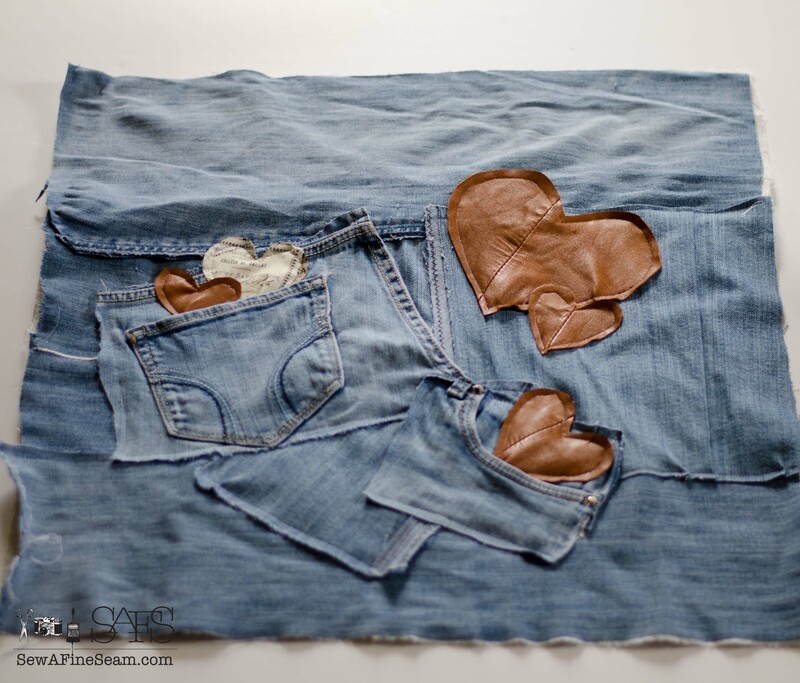 I love the combination of jean and leather…such a fun design!!! Thank you so much! I rather love it too! That pillow is SO MUCH FUN!!! The hearts in the pockets are adorable. I still love T’s comforter out of denim patches. 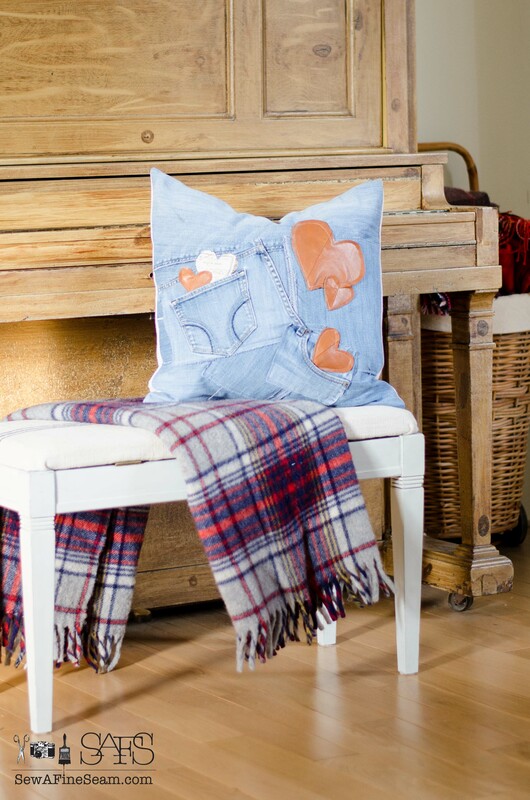 The pillow does look fantastic with your piano and plaid. That’s one of the rocking-great things about denim…it goes with anything! 🙂 I’m sure another pillow like this could be created! I bet your daughter could make you one!